We are often asked how to block the DFind vulnerability scanner (A.K.A. “w00tw00t.at.ISC.SANS.DFind”) with NinjaFirewall, our Web Application Firewall for PHP and WordPress. The bad news is that you can’t. But the good news is that you don’t have to, because it is already blocked! Several years ago, I wrote an article about it, so let’s see that issue again. 149.202.124.2 - - [15/Aug/2015:10:14:03 +0200] "GET /w00tw00t.at.ISC.SANS.DFind:) HTTP/1.1" 400 482 "-" "-"
192.198.86.54 - - [16/Aug/2015:16:14:04 +0200] "GET /w00tw00t.at.ISC.SANS.DFind:) HTTP/1.1" 400 482 "-" "-"
37.187.77.142 - - [17/Aug/2015:07:05:05 +0200] "GET /w00tw00t.at.ISC.SANS.DFind:) HTTP/1.1" 400 482 "-" "-"
In our case, the hostname was missing and thus it was rejected. It also means that you do not have to worry, you haven’t been hacked and the request was blocked by the HTTP server. That particular string is only used as part of DFind banner scanner, i.e., it only wants to find your HTTP server name. :0040648B lea edi, dword ptr [ebp+FFFFFAD4]   ; edi = destination buffer. :00406492 movsd                               ; Copy esi string into edi. :004064A0 push eax                            ; string + the CR/LF/CR/LF. :004064A1 push [ebp-2C]                       ; Socket descriptor. :004064AA cmp eax, FFFFFFFF                   ; post the request. :004064AD jne 004064CB                        ; Give up if any error. :00406544 push eax                            ; by the server. :00406548 Call dword ptr [0040C0E8]           ; Call recv(). :00406554 push 00000000                       ; returned. :00406559 Call dword ptr [0040C0B0]           ; Call shutdown(). :00406566 jge 00406584                        ; 5 bytes otherwise give up. :00406584 push 0040F1F0                       ; Offset holding the "Server:"
:00406589 lea eax, dword ptr [ebp+FFFFF8DC]   ; string. :00406596 pop ecx                             ; that sub string. ; otherwise we give up. :004065A0 push 0040D184                       ; Offset pointing to the LF (\n). :004065B2 pop ecx                             ; that line feed. :004065C1 je 004068FA                         ; find it. ; between "Server:" and LF. :0040660E Call dword ptr [0040C088]           ; Call strstr(). :00406616 test eax, eax                       ; Give up if error. :00406624 mov dword ptr [00410EC4], eax       ; signatures found. :00406629 push dword ptr [ebp+FFFFF4B8]       ; strlen() retcode. :00406635 lea eax, dword ptr [ebp+FFFFF4BC]   ; Destination buffer. :0040663C Call dword ptr [0040C044]           ; Call strncpy(). :00406642 add esp, 0000000C                   ; Clean up the stack. :00406645 lea eax, dword ptr [ebp+FFFFF4BC]   ; Fetch buffer address. Self-explanatory : send a GET request and fetch the HTTP server name. As indicated above, you cannot use NinjaFirewall (or any other script/plugin) or even ModSecurity to block it because it is already blocked by Apache, which also closes immediately the connection and, obviously, will never forward it to your script. Hence, if you still want to get rid of it, you need to act before Apache. If you are using a load balancer/reverse proxy like HAProxy, it is easy to implement. Otherwise, you still have another option: the Linux kernel firewall and its command line interface, iptables. In this article, we’ll use iptables and three of its modules : String match, Recent and TCP. Before going any further it is important to note that the following rules are perfect to get rid of “script-kiddies” randomly scanning IP addresses with widely available vulnerability scanners, but they may under no circumstances apply to an attack led by an experienced hacker specifically targeting your server that only some tougher server/firewall configuration rules could block. --from: packet offset to start searching from. By default, searching starts from offset 0. --to: packet offset to stop searching. That option and the previous one are quite interesting and useful because we can limit our search inside a packet instead of filtering it all and thus save time and CPU cycles. By default, it will search through the whole packet, the maximum limit being set at 65,535 bytes, the maximum IP packet length. --algo: the algorithm to use. There are two : Boyer-Moore (bm) and Knuth-Pratt-Morris (kmp). We’ll use the first one. --string: text search pattern (e.g., ‘abcd’). It is CaSe sensitive. --hex-string: search pattern in hexadecimal format. The pattern must be delimited by the ‘|’ sign. Hex characters can be separated by a space (e.g., ‘|61 62 63 64|’) or not (e.g., ‘|61626364|’). We can see in that example that 64 packets were dropped for a total of 5,504 bytes, or 86 bytes/packets, the typical DFind sequence. It filters all incoming packets to port 80, regardless of what kind of packets it is. That’s a waste of time and resources. It can cause errors (false positive). Chances are very low, but that must be taken into consideration. We need to set up a rule that will only filter the packet we need to filter, that is, the very first one containing the HTTP request (GET, POST…) and thus overcome the disadvantages of the string module used alone. All other incoming packets will be ignored. The client connects to the server by sending a SYN (synchronization) packet. The server responds by sending a SYN + ACK (Synchronize + Acknowledgment) packet. The client responds with an ACK (Acknowledgment) packet. At this time, the communication is established, the client can send its PSH + ACK (Push + Acknowledgment) packets, the server will respond and so on until the connection is closed. mask matches the flags that should not be set, comp the flags that need to be. There can be one or more flags in each field. Multiple flags should be comma-separated. 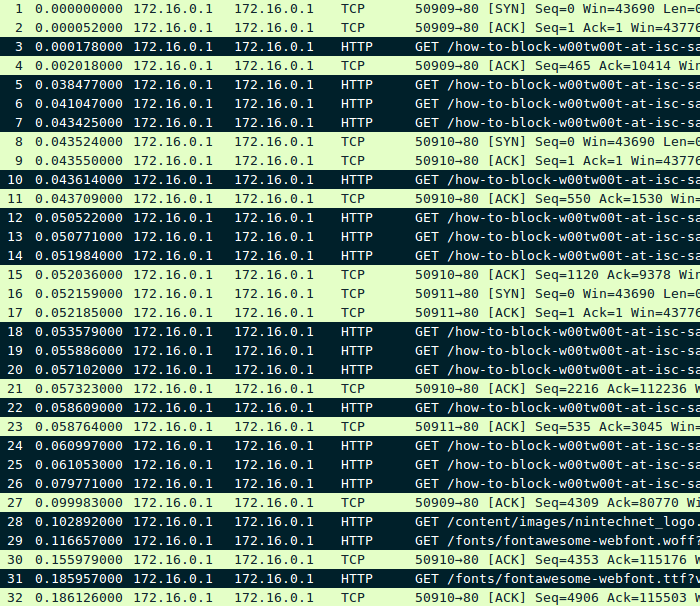 Now we are able to determine the type of each incoming or outgoing TCP packet, simply by looking at its flags. We still have one problem to solve: throughout the connection, we will send and receive a lot of packets however the only one we want to filter is the first PSH+ACK packet that comes right after the SYN/SYN+ACK/ACK 3-way handshake sequence. --set          Add source address to list, always matches. --update       Match if source address in list, also update last-seen time. --remove       Match if source address in list, also removes that address from list. --name name    Name of the recent list to be used. DEFAULT used if none given. This is a very complex module. It has several parameters but we’ll only use the above four ones. It can create a list with the IP and time stamp used in a packet and can allow us to monitor/match any recent event regarding the current connection. The list can be customized (--name parameter) or be the default one (DEFAULT). --set: we’ll use it to create the list at the beginning of any connection (SYN packet). --update: we’ll use it to update our list when receiving the ACK, right after sending the SYN+ACK. --remove: we’ll use it to delete our list as soon as we receive the very first PSH+ACK packet (which contains the HTTP request to filter). Hence, once the list is deleted we will ignore any further incoming packet from the current connection. # the SYN flag set; we create our list with '--set'. # the HTTP (GET, POST, HEAD...) request we are looking for. 3 SYN packets (No 1, 8 and 16). 11 ACK packets (No 2, 4, 9, 11, 15, 17, 21, 23, 27, 30 and 32). The remaining 18 packets, marked in black, are those we want to filter. We see that there were a total of 32 captured packets and that our first rule hooked the 3 SYN (0x02), the second one hooked the 11 ACK (0x10) and that our third rule, as expected, hooked the first PSH+ACK (0x18) packet of each of the 18 requests we wanted to filter. That’s perfect and matches exactly the tcpdump capture. # if we find it. Note: we increased the searching length to 700 bytes because there could be other HTTP headers between the ‘GET’ and ‘Host:’ ones. Generic search: some script-kiddies modify the string GET /w00tw00t.at.ISC.SANS. using hex-editors (e.g., GET /test.w00t:)). To solve the problem, we can filter on the fact that the HTTP request is non RFC-compliant, i.e., it contains the string “HTTP/1.1” followed by 2 CR/LF. We can convert it to hex values (“HTTP/1.1” => “0x485454502f312e310” and “CR/LF/CR/LF” => “0x0d0a0d0a”) and use the --hex-string parameter. IP blacklist: we can blacklist for 6 hours any IP with the Recent module. We’ll use the --update parameter so that if the scanner came back we’d keep it blacklisted for another 6 hours and so on. Connection reset: instead of dropping the packet with -j DROP, we can reject it and immediately close the connection with -p tcp -j REJECT --reject-with tcp-reset. Using the DROP action isn’t really interesting here, because when we catch the packet we are looking for, the connection has already been established (that packet follows the 3-way handshake sequence) hence the scanner knows there is an HTTP server listening. No need to try to make it believe the contrary. Alternatively, if you have the Xtables-Addons package installed, you can use the -j TARPIT action instead (bots will hate it!). # Check if that IP is already blacklisted in the w00tlist. # Look for the hexadecimal string in the first PSH+ACK. # to close the connection. It is possible to filter other ports as well, however, do not try to systematically filter any kind of string pattern with iptables because it could be possible for an attacker to split those patterns into smaller packets and thus to avoid detection. Previous Migrating a website with NinjaFirewall installed. Next Critical vulnerability in Swift Security Hide WordPress Firewall plugin leads to phishing attack.